Last week I posted an over-arching article which spanned all the different things I’ve changed in my life to approach my new healthy life. Due to the awesome feedback I received from that article, I wanted to continue to share everything from things I’ve learned to foods I’d recommend. As I said before, if there is any topic in particular you’d like me to write on in this respect OR if there’s a product you think I should give a try, let me know in the comments below! Pre-Weight Loss with a favorite snack. People who know me well will know that I love cookies. Like, REALLY love cookies. When we lived in New York City, I made it a point to eat as many different kinds of cookies as I could get my hands on. Somehow, I imagine this has some sort of link to being overweight. That being said, I have always had a sweet tooth and when trying to eat healthy and lose weight, this can be a lot of people’s undoing. I had been hesitant to try any sort of diet food. Back when I was very young, my Mom had tried Atkins and brought an Atkins recipe pumpkin pie to Thanksgiving dinner. It was literally the worst thing I’ve ever tasted. That alone was enough to cement into my head that ‘healthy’ desserts were gross and should never be trusted. So when someone at my work suggested I try Halo Top ice cream, I was fairly apprehensive. Before we get into facts and figures, we need to talk about the most important fact about this ice cream. I can tell you how low calorie it is. I can tell you the protein benefits and the low fat benefits, but none of that matters unless you know this most important fact. IT. IS. DELICIOUS! After all, what we DON’T want as people on a diet is food that is healthy as all get out, but tastes like garbage. That just reminds me that I’m not eating something wonderful, which in turn makes me fall off of my diet. Halo Top is tasty as tasty can be, so now that that’s out of the way, let’s talk facts and figures. I think this chart above, taken from Halo Top’s website is a great indicator of why this is a better choice in your freezer. First off is the simple fact that the calories are much lower. Of course, this is taking into account a serving size which is 1/2 cup. That’s about a 4th of a pint. You’ll also notice a huge reduction in sugar and carbs. Of course, it’s important, EVEN when eating something healthy to take into account the serving size. Eating too much of ANYTHING is never a good thing. A friend of mine scoops her serving into a bowl and puts the pint back in the freezer to avoid temptation. I prefer to mark the sides of my pint in order to let me know when it is time to stop. I also eat right out of the carton though. Does that make me an animal? For me, Halo Top has become that replacement. That feel good snack that allows me to indulge without actually indulging. Yes, I count it into my daily calories and my daily sugar and protein as well. In this way, it’s a prize at the end of the day. “You ate healthy all day and didn’t go over on calories. Good for you! Have something delicious!” Much like training a pet, training ourselves to be healthy is all about rewarding, not punishing. Or at least that’s what I’ve come to believe. Halo Top already has some amazing flavors, I recommend the Birthday Cake and Oatmeal Cookie in particular, and they are coming out with many more. You can find them at most grocery stores, and while they can tend towards the pricier end, I really do believe that my health and wellness is worth it and yours should be to. Sadly, in this country, as well as in this world, being healthy is more expensive than being unhealthy. It’s something I vent to my mother about on a daily basis. But if anything is worth an investment, it’s you! AND, they’ll be releasing some new flavors very soon!!! Learn more about them at HaloTop.com! Let me know in the comments and maybe I’ll try it and review it here on the site! 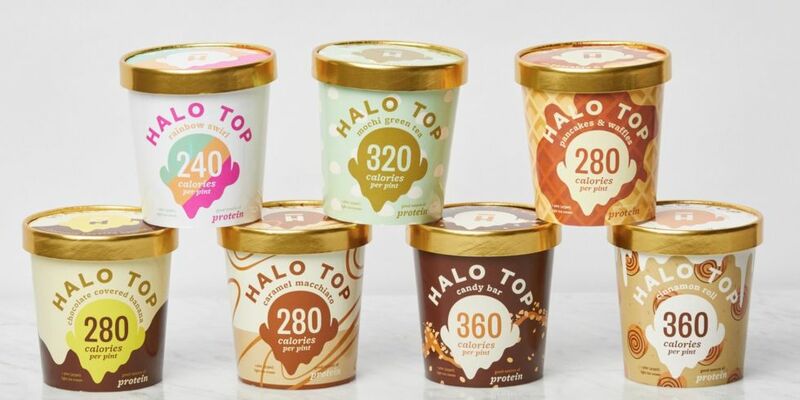 And if you already eat Halo Top, let me know your favorite flavor in the comments!!! I just tried vanilla bean. It’s also delicious. I’m not sure how you have the will power to eat a single serving of Halo Top! I purposely leave calories so I can eat a whole pint. lol! Haha. It takes a lot of convincing to put it back in the freezer. Some days I do better than others. Well, I commend your super powers! I on the hand will stare contentedly at the bottom of my Halo Top…lol!